Welcome to video five in the How to Play Guitar series. In this lesson, we’re going to take everything you’ve learned and put it together to play your first song. 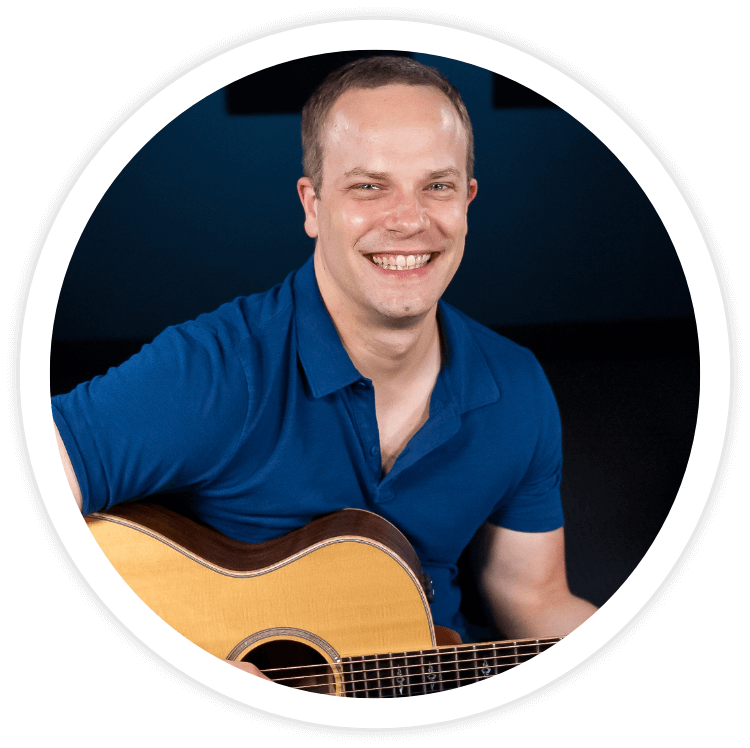 If you want to go back and review the lesson on chords or the lesson on strumming patterns, now is a good time to do that. Once you’re ready to go through this lesson, we’re going to take the four chords you learned and play them with the last strumming pattern you learned so you can play Brown Eyed Girl by Van Morrison. Putting everything together and concentrating on so many things at once may seem intimidating at first, but if you keep practicing it will be a lot of fun for you. First, we’ll look at the chord progressions used in this song. There is one chord progression for the intro, verse, and chorus, and then another chord progression for the pre-chorus. If you need help keeping track of the order of this song, you can download the PDF that outlines the chord progressions for each part of the song. Our first chord progression starts with a G, and it is played for one measure. In fact, all the chords in this song are played for just one measure. As you make this chord, remember the tips you’ve learned for keeping your chords clean like good hand posture, using the tips of your fingers, and being right behind the frets. From the G, you’ll move to a C. Make sure you bring your elbow in close to your body so you can reach your third finger out far enough to make this shape. When strumming the C, don’t forget to leave out the low E string. Go back to a G, and then the last chord in the progression is a D. Make sure you’re using the tips of your fingers here so you don’t accidentally mute any of the other strings, and strum only the top four strings. That’s the main chord progression for this song, playing the G, C, G, and D. Make sure to have each of these individual chords down cleanly, and as you start to string these chords together, only play a couple at a time. Practice changing from a G to a C, and once you have that change down well, you can move on to the rest of the progression. As you get this down, you may run into stumbling blocks here and there, but that’s okay. It will take some time to get this down. Remember that every chord in this progression gets played for one measure, so four beats each. The last chord progression that you need to know for this song is for the pre-chorus. It starts with a C, goes to a D, a G, and then an E minor. This is the first half of this chord progression. Again, every chord here is played for just one measure. For the rest of the chord progression, it kind of repeats itself. Move to a C, a D, a G, and then finish with a D. You can think of this whole progression as two halves, the first being C, D, G, E minor, and then the second half is C, D, G, and D.
Keep in mind all the tips and techniques we’ve talked about in this lesson series to keep your chords clean, anticipating the next chord, and working on individual chord changes. Take some time to work on each of the chord progressions. You want to memorize them, internalize them, and really get them down. Once you can easily move from chord to chord, you can add in the last strumming pattern we learned in the strumming lesson to play the full song. You can see that strumming pattern on-screen in the video as I play through the pattern for you. If you need to, take some time to work on the pattern without worrying about chords right away. Stay relaxed as you practice, and once you’re confident with the pattern, you can start trying to add in the chord progressions. For your main chord progression, G, C, G, D, you’ll play one chord per measure, which works out well since the strumming pattern is one measure long. Basically, you’ll play the strumming pattern once for each chord, like I demonstrate in the video. As you start to play, take your time and know that it’s okay if you need an extra second to get to the next chord. When you’re able to play through that chord progression with this strumming pattern, play through pre-chorus chord progression with this pattern too. Once you can do both, you’ll be able to play through this song. You can break this song up into sections as you learn it and work on it in small chunks until you can play the whole song on your own. After you’re able to play through the song on your own, you can pull up the song and jam with it. That wraps up the How to Play Guitar series. Hopefully you’ve learned a lot, enjoyed working you way through the lessons, and realized your potential on the guitar. Remember that it takes time to learn all of these things, plus build up the strength and dexterity for playing guitar, so don’t be frustrated if you can’t do it all right away. Feel free to go through this series a second or even third time if you need to. It’s great if you do, because you’ll pick up on a lot more as you go through it again and remember all the tips and techniques better too.